Glumac, partnering with Turner Construction, signed on to provide engineering services on the fast-track, net-zero P Street design-build project in Sacramento, CA. Tapped to also bring its sustainability-focused knowhow to the team, Glumac compressed the time-intensive workflows that are typically required to support projects with such audacious energy use goals. They did this by formulating a workflow that was equal to the ambition of the project, working with the project team from a shared Revit model using Autodesk BIM 360 Design software for design collaboration. This new level of teamwork helped boost productivity and condensed what are normally months-long project phases into mere days. The use of software to streamline coordination and reduce rework inadvertently helped reduce the carbon footprint of P Street’s project delivery. Glumac, which was recently acquired by Tetra Tech, has always had a commitment to designing building systems that efficiently support comfortable spaces. The firm has wholeheartedly embraced sustainable design, having designed more than 250 LEED-certified projects. Their eagerness to embrace innovation led Glumac to adopt BIM (Building Information Modeling) with Revit building design software before many other MEP firms did, and the firm continues to forge ahead with its use of cloud-based design. The Sacramento building will be the new home of the California Natural Resources Agency. Undertaken by California’s Department of General Services (DGS), to provide office space for more than 3,400 state employees, the P Street project is targeting a LEED Platinum certification and net-zero carbon use. The 22-story building will include 838,000 square feet of space. DGS decided to undertake the P Street building as a design-build project with an aggressive schedule for both design and construction. The accelerated project schedule left little time between creating the high-level design concepts and developing the shop drawings the subcontractors would use for fabrication and installation of the building systems. That meant Glumac would have to juggle coordination with the architect and other engineers simultaneously as its team assisted the subcontractors—including Southland Industries, Redwood Electric, and Intech Mechanical—to develop shop drawings. 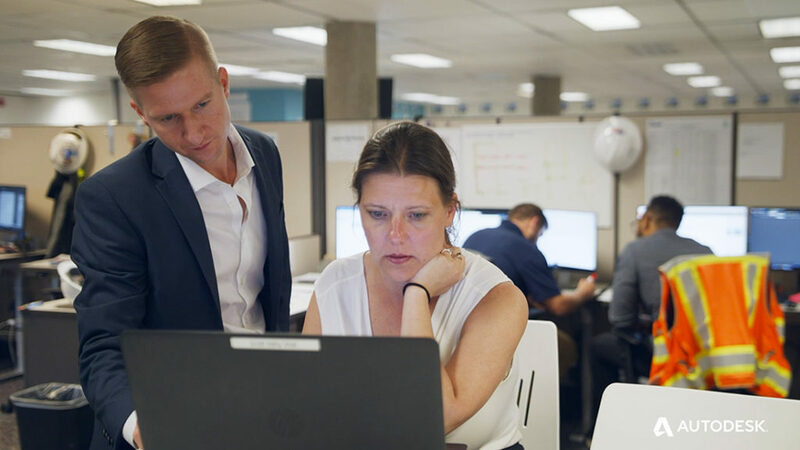 Jennifer Berg (right) and Tim Totin (left) worked on the same design models in Glumac’s Irvine office with collaborators from four west coast offices in the United States. Meeting sustainability goals required both smart design choices—like fins to shade windows—and advanced MEP technology, including radiant floors, chilled beams to replace traditional HVAC vents, solar panels, and more. The building will even use graywater and rainwater for flushing toilets. As the Glumac team developed the building systems, its team used BIM 360 Design to co-author the structural and architectural models in Revit. Basically, the teams coordinated together in the BIM 360 platform, concurrently iterating on the models to accelerate the design process while also bringing the contractor into their process. This approach helped everyone take constructability into account as the sustainable design collaboration progressed. When the concepts were finished, Glumac and the subcontractor jumped right into the shop drawings—bypassing the detailed design phase. BIM 360 Design made that possible because both teams could see and work from each other’s models, making corrections and exploring issues collaboratively as needed. Cloud collaboration helped the team cut back on travel and all the carbon emissions associated with travel. Plus, they used essentially no paper on the project. “We went straight from the concept to helping create the detailed shop drawings,” says Nick Gallucci, managing director at Glumac. The Glumac team traveled less than expected on the project, but it was able to assemble the most qualified team to deliver the net-zero design. How? 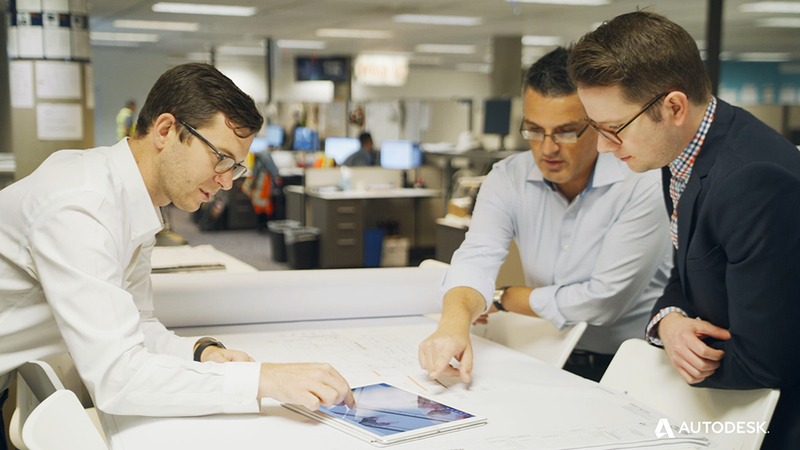 BIM 360 Design let Glumac include team members from multiple office locations. “People from our Los Angeles, Irvine, and San Francisco offices worked together seamlessly with staff from the multiple project member firms, all in real time,” says Berg. Nick Gallucci (left) visits Glumac’s Sacramento office with Tim Totin (right) where the P Street project is currently undergoing construction. As new project delivery methods connect teams in ways traditional methods can’t match, general contractor Turner Construction anticipates that the collaborative approach used on the P Street project will become more common. For instance, beyond using BIM 360 Design to coordinate with architects and engineers, Turner also uses BIM 360 Build to collaborate on QC inspections, checklists, and issues, significantly minimizing the amount of paper used and time required for these processes on the jobsite. “Close collaboration creates value. It helped make P Street’s sustainability goals a reality. Sharing real-time design information is critical to design-build projects,” says Adam Della Monica. Learn how BIM collaboration can reduce coordination challenges and improve your Revit team’s productivity.